Dr Andrew Wakefield, a vaccine researcher who found that the combined measles-mumps-rubella (MMR) vaccine appears to lead to serious side effects, including post-vaccine autism in a number of the children receiving it, is being ostracized from the medical community and his carreer is being targeted to shut up unwanted criticism that could go to the heart of the multi billion dollar vaccine business. 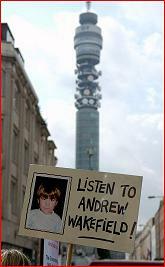 At a hearing that is being drawn out by the British General Medical Council (GMC) to last over 18 months, Dr Andrew Wakefield begins presenting his defence on March 27th 2008. Dr Wakefield and his other two defendants have been the victims of the most terrible distortions of truth and assailed by lies after they uncovered and brought into public view the health crisis created by the MMR vaccination that has left hundreds of children suffering from serious bowel disease and regressive autism. The GMC and the science lobby groups together with Brian Deer who is the sole complainant in the GMC fitness-to-practice case, have studiously avoided all reference to the parents and damaged children. Determined to support their doctor, these children and their parents are running an energetic campaign against the GMC, the lobby groups and Brian Deer. However, with much of their income taken up by caring for their vaccine damaged children there is little left to run the campaign. Cry Shame, the parents and professional organisation in support of vaccine damaged children and those suffering from regressive autism have organised a major demonstration on March 27th, the day that the GMC prosecution begins again. As well as asking for your support in sending the attached leaflet out on as many lists as you have access to, Cry Shame is also asking for you to make a sensible financial contribution to the campaign and particularly the organisation of the demonstration. Meanwhile, pharmaceutical producers are activating all their resources and are cranking out studies that show what Wakefield found must not be trusted, that vaccines do not cause autism and have never ever done so, at least that is the interpretation these studies are given in the press. It appears to me however, that these efforts may be motivated by the prospect of losing a huge source of government-supported income from their vaccine business. If the public were to "lose confidence" in vaccinations, much of this business would go down the drain and that prospect is seen by both the manufacturers of vaccines and by their friends in government health offices as a simply unacceptable scenario. Vaccinations are seen as a holy cow of medicine that must not be endangered by unacceptable contrary research results. One might even speculate that the "vaccine damage compensation" programs run by governments are merely a tool to keep things quiet on the vaccination front. Vaccine damage cases can not be brought before the ordinary courts. The special vaccine compensation programs do eventually pay, but no one really hears how many cases of vaccine damage there are. Everything is well insulated from public scrutiny, while of course public money - your taxes - pay the damage done by pharma's vaccines. CryShame is committed to making your voice heard as the eyes of the autism world turn to London. On the 27th March we plan to display messages of support for the doctors, from parents, children and professionals throughout the world, in front of the GMC building. We then plan to continue the campaign for the length of the hearing and beyond. On the day he walks into the GMC building to begin his defence, Dr Wakefield will be presented with EVERY message received. The eyes of the autism world are on us. Please be with us. While government officials continue to maintain that vaccines don't cause autism, advocates say the recent settlement of the girl's injury case in a secretive federal vaccine court shows otherwise. The U.S. Department of Health and Human Services has concluded the family of Hannah Poling of Athens is entitled to compensation from a federal vaccine injury fund, according to the text of a court document in the case. The amount of the family's award is still being determined. Martin Walker, known for his classical work Dirty Medicine and more recently for Skewed and HRT: Licensed to Kill & Maim as well as a series of other works critical of the current paradigm of organized, pharma-dominated medicine gives a good overview of the pharma-inspired and government-run campaign against the doctors who dare go against the system and recommend - God forbid - a return to single vaccinations instead of currently used dangerous combinations such as the MMR (measles-mumps-rubella) vaccine. The fitness to practice case before the General Medical Council (GMC) against Dr Andrew Wakefield and Professors Murch and Walker-Smith, which is to be heard on 27 March in London, appears to involve an analysis of the scientific research and clinical practice of these doctors. However, almost all of the case and the attacks that have taken place against Dr Wakefield since the mid 1990s are politically inspired. They are a part of the government's drive to produce a single multiple vaccine containing hundreds of viral strains and also a key part of the government's co-ordinated policy for health care that has been resolved in negotiation with the pharmaceutical companies since New Labour came to power in 1997. The analysis of Dr Wakefield's 'road to the GMC' by Martin Walker is divided into two parts, the political background and the scientific side of the debate. "For my final essay for Cry Shame before the big demonstration on March 27th I have gone back to the beginning of the GMC fitness-to-practice hearing . For the first time, I discuss the role of the complainant, the journalist Brian Deer, the pharmaceutically funded agency Medico Legal Investigations and the New Labour Government as well as the GMC in laying the complaint against Dr Wakefield, Professor Murch and Professor Walker-Smith. The GMC hearing could be part of a law school learning module on 'abuse of process', nowhere more so than in its origins. How could it be possible for a single pro vaccine journalist to have such command of the medical-legal process that he can initiate one of the biggest prosecutions in GMC history against three doctors whose research casts doubt on the safety of MMR? How could it be possible that an agency solely funded by the pharmaceutical industry could help this journalist bring the complaint before the GMC? Finally and perhaps most disconcertingly, how is it possible for the General Medical Council, an organisation granted serious legal powers under an act of parliament, to work in collusion with the government and the pharmaceutical industry dragging out a prosecution over a period of five years in order to protect the governments vaccine programme?" i to have a doughter after reciving the triple vaccine changed and the diagnose is autism we are doing oll sorts therapy there is still long way to go as my doughter regressed and know is 7 years old and can only say one or two words.